February will soon be upon us — the month of romance. Typically, this is the time for bridal shows and let's face it, it doesn't get much more romantic than planning for a couple's big day. For people promoting their expertise or products at these events, however, romance is business. For everything from advertisements, to flyers, to business cards and courtesy gifts, people are looking for safe resources for illustrations that polish their professional image or promote the theme of love and romance. Also, smack dab in the middle of February is Valentine's Day. There are any number of reasons a person would be looking for images to use for this special celebration. Last year in the United States, it was estimated that Valentine's Day would contribute around $17.6 billion to the economy, according to the National Retail Federation. Obviously then there is a commercial need for appropriate illustrations and photos to be used in Valentine-themed advertising and promotions. Regarding gifts for our sweeties, not everyone goes for the big-ticket items such as fancy dinners and jewellery, opting instead to put their personal touch on the occasion with a hand-made greeting card. 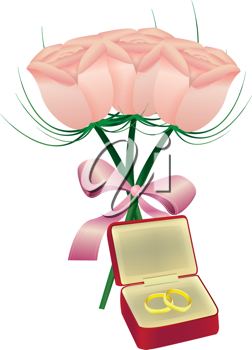 You can still express your love with hearts and flowers using backgrounds and elements from online clipart sites. Another romantic offering that can be enhanced by online illustrations is a photo album or scrapbook containing pictures of you and your special guy or girl, from past to present.